A new building was started to create a more balanced set-up on Splitveld Fabriek. 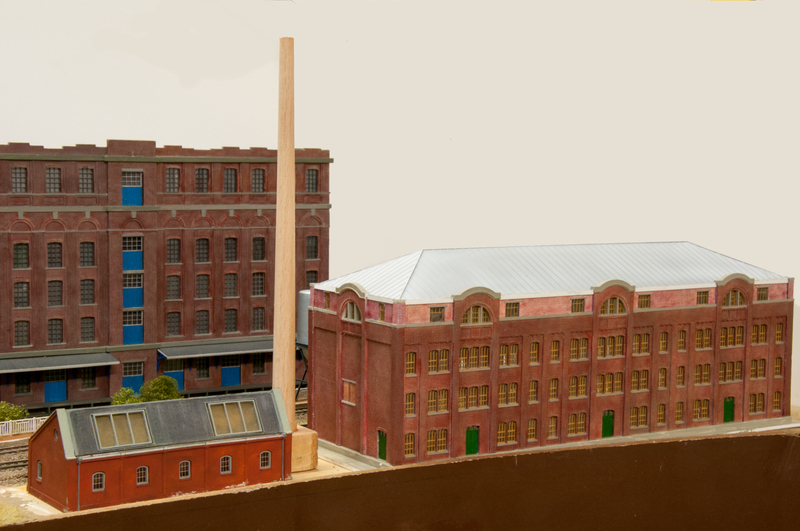 I found the SCAR building too high for that particular place at the front of the layout, about 2/3 of the height but the same length would form less of a view block and will create a better balance when viewed lengthwise and front. 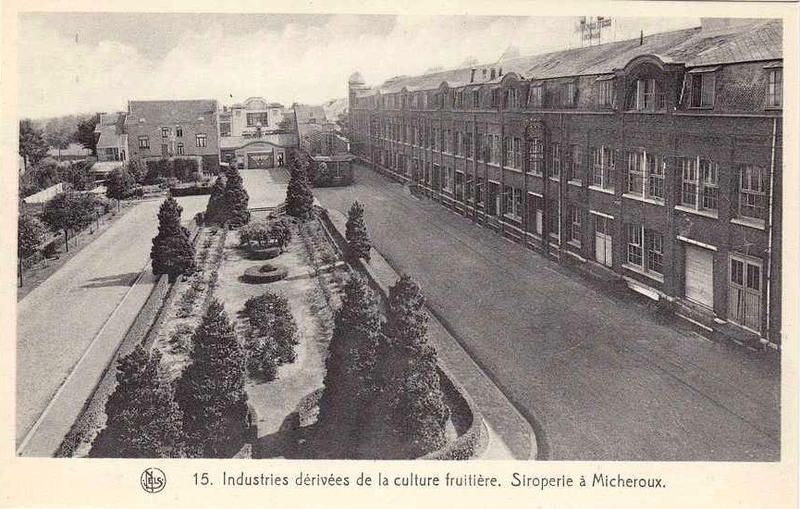 The choice went to the siroperie from the agricultural cooperation in Micheroux. Postcards of this building can be found in the book about line 38 as well as on the internet. Micheroux was once a big station with many tracks and several rail connections in the form of coal mines and agricultural cooperations. One of these was on the north side of the station where there was a rail connection with a very large cooperation with several interesting buildings. Some of these buildings are still in existence today and are currently renovated and rebuilt for new uses. 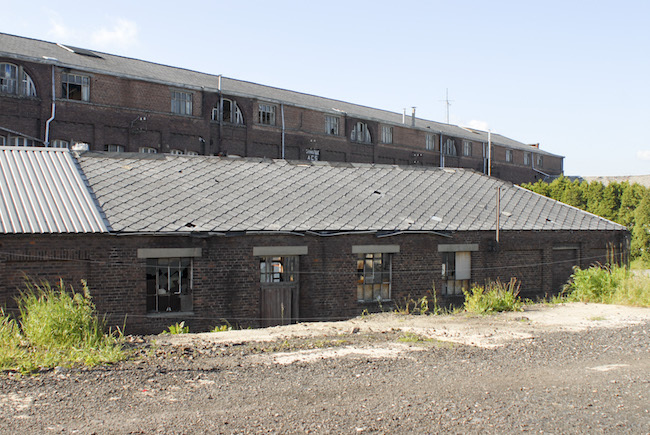 The siroperie is a very long building at a slight angle with the railway. My version is only based upon as the actual building is far too long and I can only accommodate 3 sections. This building is under complete renovation with new windows and roof, but it is nice to see that the original curved frontons that had disappeared are now back again. These certainly make the building stand out. It can be observed with Google Earth along the rue the siroperie in Micheroux. The building is much longer than I can accomodate on Splitveld, it contains 7 repetitive sections each with 5 bays and the end is closed off with an entirely different plain part. In between the railway and the building there was a boiler house with chimney but these have now disappeared. Puzzling is that the railway fronted side seems to have 4 levels with the lower one as a sort of souterrain where the other side only shows 3 levels on the Mels postcard below. Studying the old photo's (from the book on line 38) it looks that the front area has been filled in at a later date with the original wall around the front yard disappearing and making place for a much higher situated neat garden as seen on the postcard below. One photo shows a lorry behind the wall with its roof below the lower windows on the postcard below and at this level there are no doors but only windows visible. Anyway my final design goes for 4 levels because that is what I need for height. I have only 3 pictures that I took when biking along the ravel 38 in 2006, these date from before the renovation and I have no measurements. 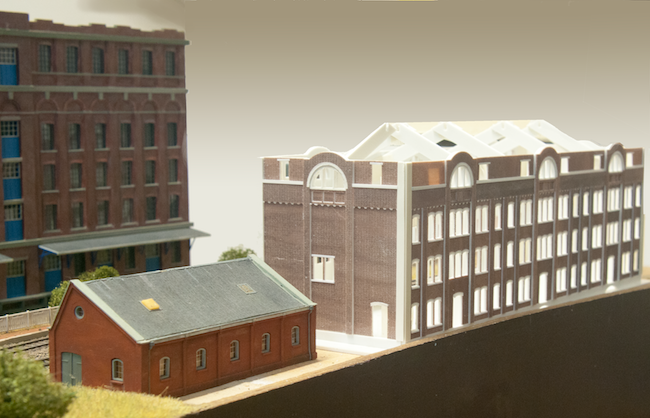 Thus I applied full modellers license and it is just based upon to fill this particular spot on Splitveld with a dedicated building. The Scar building will find a new place at some future module but then more in the background. A Mels postcard showing the off-railway facing facade of the building with only 3 levels but still having its original curved frontons and Mansarde roof with slade tiles and the top floor is the steep part of the Mansarde roof. This postcard also shows a typical period advert on the roof, a similar construction was also on the neighbouring building, the shoe manufactury. The yard at front has probably been filled in at some later period when we compare different photos. Unlucky none of these photos are dated. 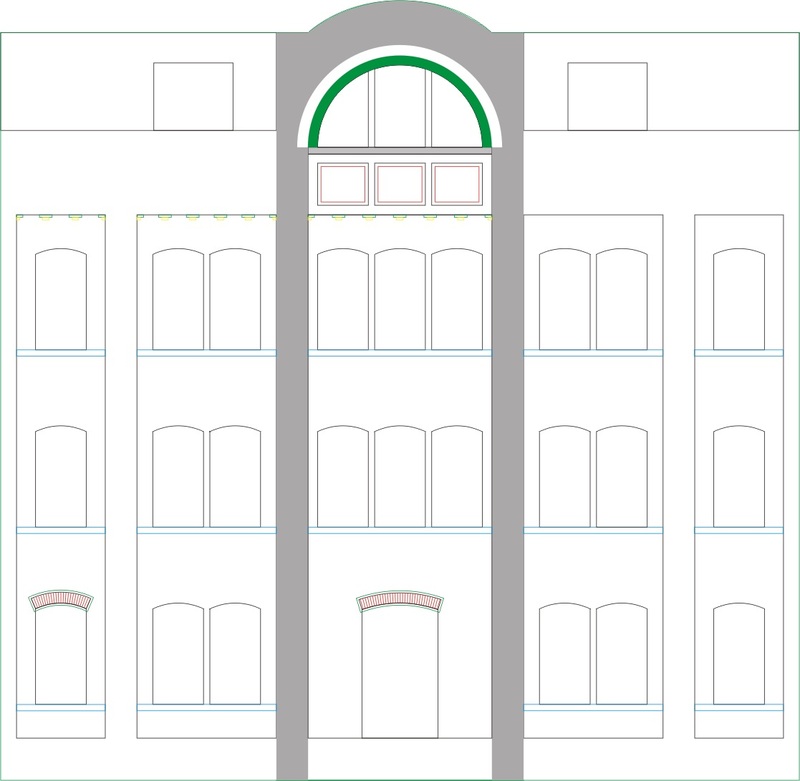 The lower windows in the central bays certainly differ with respect to my version but that is entirely my choice to limit window variation to a minimum. 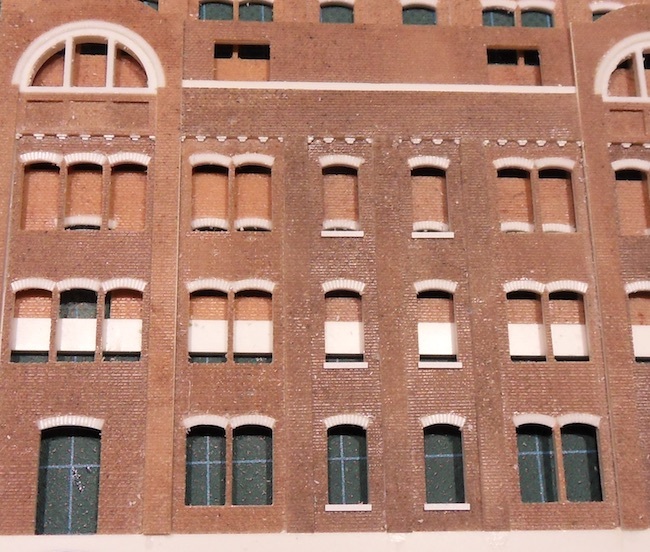 The brick levels were slightly adapted to optimise the brick sheet layout. The main facade top seen from the (former) rail side. The top story is still looking newer with different colour of bricks. It obviously was built when the changes to the roof were made, also the curved frontons have disappeared, probably to simplify the roof construction. 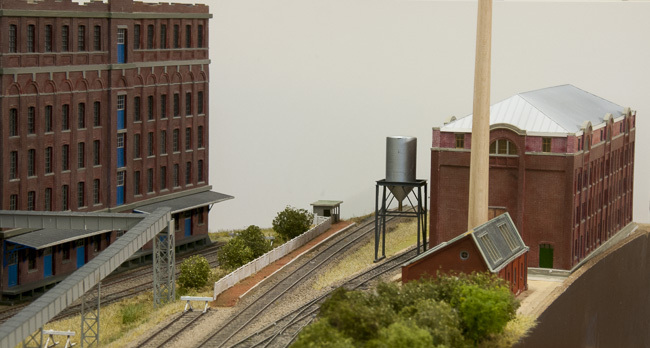 This photo also shows that the boiler building was still there in 2006 but the chimney disappeared. The roof that can be seen on Google Earth is a complete renewal with modern claddings but the facade has it curved frontons back again. The start with the milled bays in white plasticard, part is already cladded with brick inserts. Progress is made on cladding the milled base with brick inserts. Starting with the deepest layers the facade gets built up layer by layer until the top layer is reached. 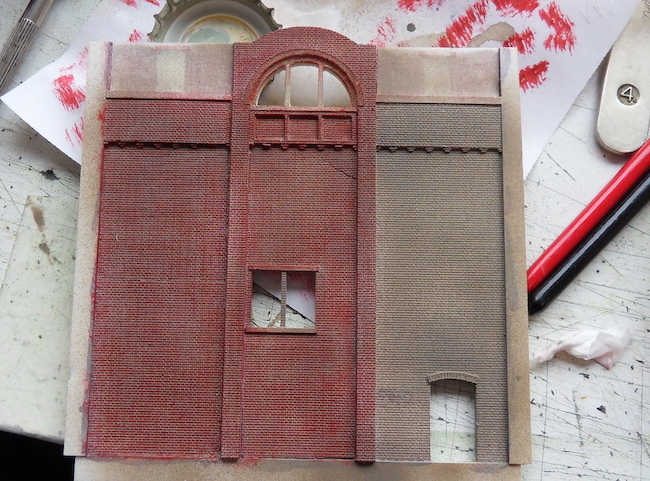 On the second photo I am about half way with a single facade consisting of 3 sections. This building could quite well also find use as school, hospital or university type of building in urban settings. Progress with detailing the top of the bays with fairing bricks and fixing sills cut from strip using a NWSL chopper. The process of getting these fairing bricks in the right place in one go is shown in the second photo with one of the end facades. Special keeper strips were cut with these bricks in the right position. The bricks are then positioned with some glue on the back and cut loose with a scalpel along the milled groove representing the second row of lower lying bricks. After that the keeper strip itself is lifted and thrown away. 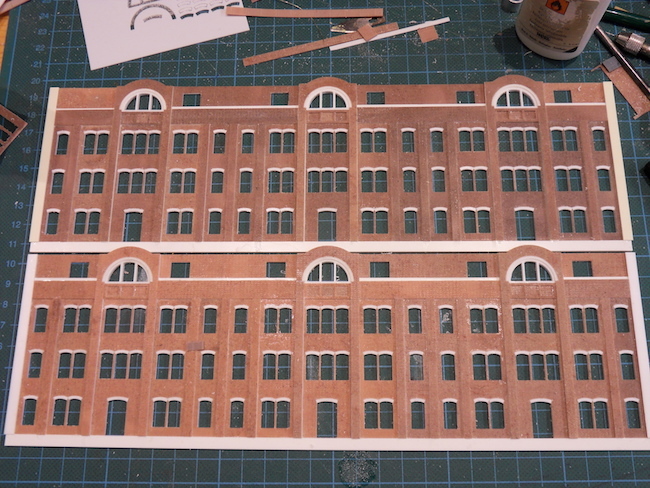 All facades are now completed with strips, this picture shows how it looks on the layout. The distracting background was photoshopped away. There is some detail that needs attention but overal this building will do the job. Next step is painting all the white plastic card edges in a red primer to prepare for final painting of the building. Painting will be easier when the facades are still flat, but the last bits can only be done when the lot is glued together. Painting is by dry-brushing the surface colour of the bricks leaving the deeper lines in mortar colour. A hard flat brush with relative thick pig hair fibers is used for dry-brushing, these fibers don't reach into the mortar pockets as long as you don't overload your brush or use too wet paint. A test run of the windows to check dimensions and any errors. It is simply less work to produce the right items first time out. 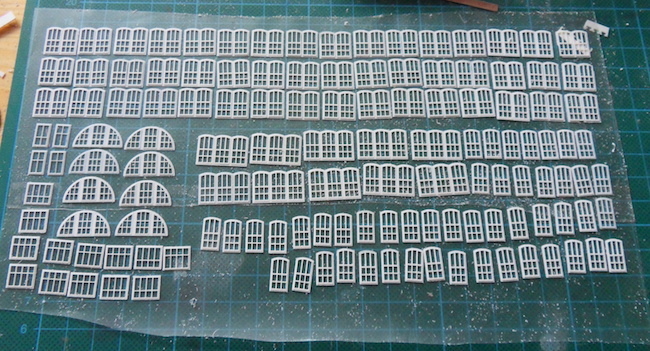 Thus it is important to check the main window, because I need 144 of these and that will take its time to produce. These items are milled from 0.5 mm PS using a straight 0.3 mm cutter with speed settings between 4-8 mm/s. Even when each window takes less than 2 min a piece then it still comes to ~4.5 hours machining time in total. Of course with higher speed settings the time can maybe be reduced a bit but experience shows that too high speeds lead to window bars with varying thickness caused by vibrations. 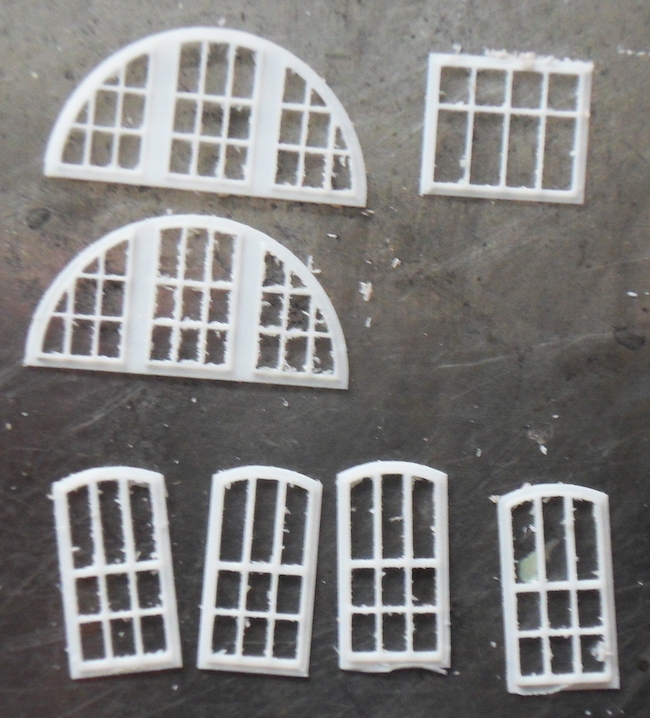 All windows including some spares stuck to a piece of masking foil such that they can be airbrushed easily into the colour of choice without being blown away when painting. 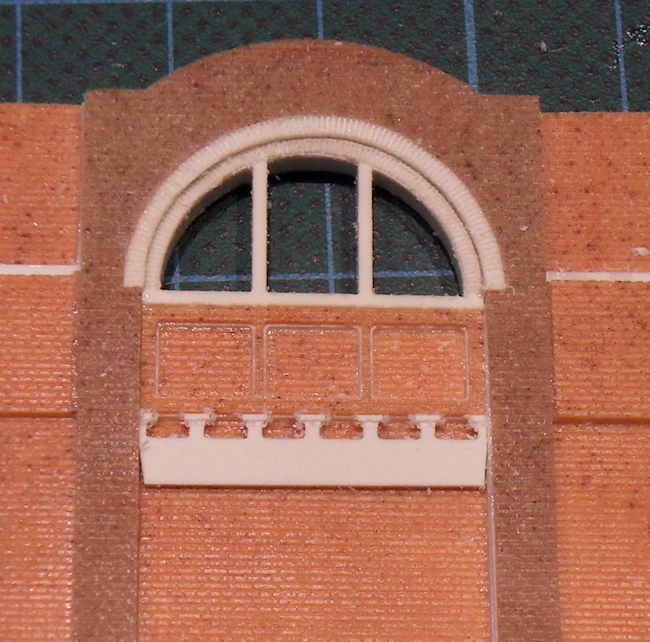 I found this colour making the facade too dark when viewed in a test on the layout thus I decided to repaint them into a lighter yellow/brown. It is better take them off before the paint is hard otherwise they may stick to the foil by the paint and can be damaged when trying to pick them loose! You don't earn any points for guessing how I found out, but I had enough spares to compensate for such a thing. 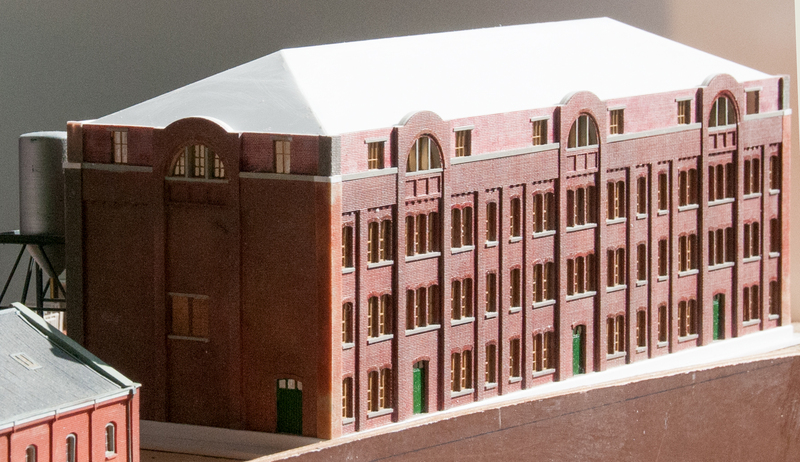 Brickwork is now completed but the last added strips on the corners still need some paint. Windows are now inserted and glazed. The corners are completed with strips of bricks with 45 degrees angles to produce sharp corners. There is an internal rigging prepared for placing floors but none of this is glued yet. A roof was produced from 1 mm white plastic sheet. This needs to be cladded with slade tiles but first the gutters and frontons need some attention. The building including the frontons, complete roof and some capping stones on the top of the corners and gutters. I decided not to use slates as the commercial sheets I have are too small and gluing 2 together without leaving a visible seam is probably more or less impossible. Therefor an easier approach was followed by producing a 'roevendak'. This is similar to the modern version after the renovation which can be seen on Google. Nowadays this can be produced in any roofing material but in older times it was mainly produced in either Bitumen or metals such as Zinc or Copper, the latter only in the wealthier surroundings such as Stockholm. On the above photo the paint is still wet, grey primer with a touch of black, finishing layer comes later. The photo also shows an unfinished chimney produced on the lathe from a piece of beech. In modern times it probably should become a windmill.